PRINCETON, N.J. -- Americans perceive Donald Trump as being able to do a reasonable job of handling the economy as president: 36% say he would do a good job if elected, and 27% say he would do a fair job. However, it is downhill from there for the newly minted Republican presidential candidate. Fewer Americans say Trump would perform well on two other core leadership tasks, with 29% saying he would do a good job on immigration and 17% on foreign affairs. An official candidate for only a month, Trump has already waded chin deep into some specific foreign policy areas. He has taken an aggressive stance toward Mexico on immigration, China on trade and President Barack Obama for being too soft on Russia. While Trump's "good job" ratings on relations with each of these nations are about the same, between 17% and 19%, the percentage saying he would do a "bad job" varies from 47% for relations with China -- and 51% for relations with Russia -- to 57% for relations with Mexico. 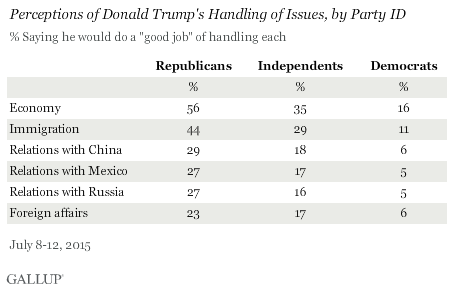 Trump's ratings on all six issues tested in the poll are much better among rank-and-file Republicans than among independents or Democrats, as would be expected given that Trump is running as a Republican for the GOP nomination. 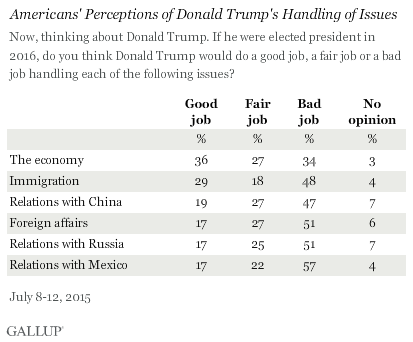 However, the only issue that a majority of Republicans think Trump would do a good job of handling is the economy. The new Gallup poll, conducted July 8-12, reveals some minor differences in Trump's specific foreign policy ratings when those saying he would do a fair job are factored in. Most notably, while 39% anticipate he would do a good or fair job of handling relations with Mexico, that belief rises to 46% saying the same about China. The economy, immigration and foreign policy have been challenges for every recent president. It is as much a function of the times as the person occupying the Oval Office. Still, Trump elicits less confidence on each of these issues than the Democratic front-runner, Hillary Clinton -- the only other presidential candidate Gallup has evaluated with this question to date. In May, 42% of Americans said Clinton would do a good job on the economy, slightly exceeding Trump's 36%. Clinton had a similar edge over Trump on handling immigration, 35% to 29%, respectively. The former secretary of state generated significantly more confidence on foreign affairs, with 42% saying she would do a good job on that dimension, compared with Trump's 17%. In addition to Clinton's stronger foreign policy resume helping to explain these gaps, she has a significantly higher favorable rating from Americans: 50% viewed Clinton favorably in May, compared with 31% viewing Trump favorably in the new poll. Thirty-one percent of Americans view Trump favorably, including just shy of half of Republicans (49%), and only a quarter perceive him as a serious candidate for president. That's a shaky base from which to campaign, much less defend controversial positions. However, he appears to have some credibility with Americans when talking about the economy, perhaps reflecting his background as a long-time businessman who has built a fortune in real estate and had a successful reality TV show featuring his boardroom skills. Trump's comments on immigration were highly controversial, perhaps contributing to fewer than three in 10 Americans saying he would do a good job on that issue. But it appears he has even less credibility when it comes to handling relations with Mexico and with other countries important to U.S. foreign policy. For results based on the sample of 507 national adults in Form A, the margin of sampling error is ±6 percentage points. All reported margins of sampling error include computed design effects for weighting. One in four Americans consider Donald Trump a "serious candidate" for the 2016 Republican presidential nomination. This is similar to Americans' views of Trump in 1999, when he ran for the Reform Party's nomination. Christians' reluctance to back a presidential candidate who is gay, an atheist, a socialist or Muslim may limit these candidates' chances nationally. Nonreligious Americans' coolness toward evangelicals dampens their chances.